This article was written on 05 Dec 2014, and is filled under Author: HollowOutsider. Some times, we just want to laugh with a splash of the grotesque and bad puns. 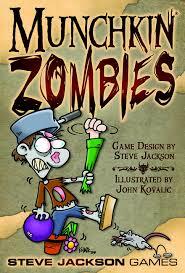 In classic Stephen Jackson Games fashion, may I present Munchkin Zombies and Munchkin Bites. If you are unfamiliar with the Munchkin series of games, they are a dungeon crawler type of table top game without all the complex leveling, dungeon master and hours of tedium. 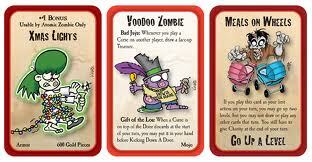 It is simply a card game where you want to reach level 10 before your friends take all the glory and treasure. Both Munchkin games can last anywhere from 30 minutes to two hours, depending on how helpful or how hurtful you want to be to other players; it’s all about balance and timing. The real question is, why should I play this game? For one, it is amazing how much you can bring to it. The rules are a simple skeleton; the real game is how you can use your surroundings. The game play starts and ends with each player so every game becomes unique to the friends you are playing with. Stephen Jackson Games love to poke fun pop culture and genre; no truer thing can be said about this game. Secondly, you interact with real humans. Too many games, especially on the console and PC, keep you from interacting with others short of online multiplayer. I love my Xbox and playing games alone, but breaking away from a structured format and drinking with buddies always levels my social XP up, and drinking duh. Each Munchkin version plays similar to one another with minor differences. During the Bites version, you have the ability to call upon Minions to help in combat and be a sacrificial lamb. Also, the different races you can be are Vampire, Changeling, and Werewolf. On the other hand, the Zombie version does not have Minions to play and has an array of different Zombies to become like an Atomic Zombie with power of fire or a Rotting Zombie with the Power of being exceptionally gross. 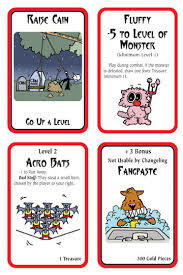 Each version also have specialized enemies and bonuses, but; as with all versions of Munchkin you can mix the versions together without special rules or modifications. My recommendation, buy a version of Munchkin for yourself because so many variations exist (Cthulhu, Conan, Space etc.). The games are an inexpensive investment (around $25 per game) and hours of fun and swearing; a great introduction or reintroduction to table top gaming. Also, download a free Munchkin Counter app for the iPhone or Android device to save some paper while keeping track of your character. Save a tree, kick in the door, and slay the monster.